The first one will deal with what we have experienced about the nature of “the economic”; with the use of this notion, I wish to insinuate an analogy to what we associate with “the social”; namely, the social embeddedness of the economy as Polanyians frame this concern. The following observations are concerned with the distinction between justice within consolidated polities and justice between such polities. This is a distinction of which legal scholarship became aware thanks to Magister Aldricus of Bologna at the end of the 12th century. Aldricus wondered which law should govern in cases with links to different jurisdictions. The third part of my story – and a concluding remark – will ask, first, whether a synthesis of both concerns, i.e., of domestic and inter-European justice, is conceivable in principle — and then whether it is still available. After the crisis, this is the 1 million dollar question: How can the European project get back on track, regain legitimacy, rise from its ruins? Timewise, my re-construction starts with the project in 2012. This was a critical point in time. The crisis had been with us for some four years. The concern with justice, however, had older roots. The book project was not designed as a response to the crisis. Instead, the crisis interfered with its design and posed new challenges. The introduction of the editors mirrors this tension lucidly. 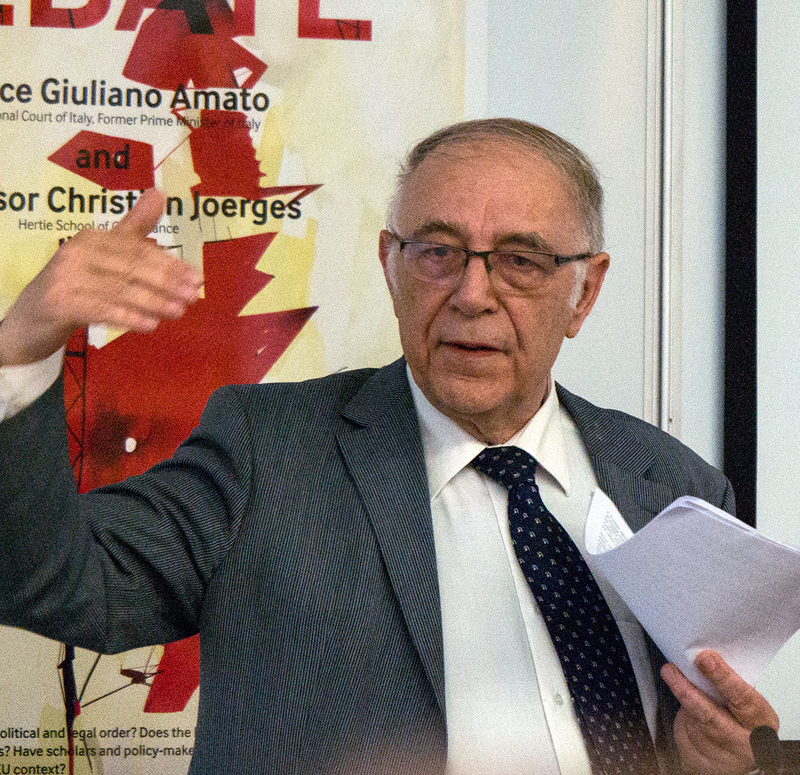 The quest for justice was a follow-up to what had motivated European law scholarship so far: the quest for economic rationality and efficiency through the completion of the internal market, the response to the democracy deficit which fostered the search for a constitution for Europe, the discovery of a “social deficit” which came en vogue around 2005. Europe, the ever closer Union, as the editors tell us, has achieved a degree of maturity, a “constitutional essence”, in which the focus on economic integration and the benign neglect of justice has simply “outlived itself”. Or has it? To cite Dimitry again, we must not neglect Europe’s potential as an actor and agent of injustice. “Injustice” is the leitmotiv of Douglas-Scott’s chapter, and a good number of other contributions provide extensive crisis analyses. The agenda is hence twofold, rightly and unavoidably so, for reasons I can only hint at. Among them is Niklas Luhmann’s insight, that the complexity of modern societies makes sudden comprehensive re-orientations and changes in a single direction simply inconceivable. But let me now proceed, as indicated, to economic ordering and justice with consolidated democracies. “Die Wirtschaft ist das Schicksal” (the economy is our destiny). The ordering of the economy has to be our core objective. This is how Walter Rathenau, politician and industrialist, commented on the state of the Weimar Republic in its first years after WW I. This kind of attention and assessment of “the economic” has not prevailed in European law scholarship, certainly not in pre-crisis Europe. Seemingly paradoxically, the only school of thought which, from early on, assigned constitutional importance to the ordering of the economy was Germany’s ordo-liberal school. Implicit in this version of economic constitutionalism is the understanding of social relations as exchange relations between market citizens. Not only Oliver Gerstenberg, but also a couple of non-German contributors also know about it. Not one single contributor identifies with this school or with any other variety of neo-liberalism. A legal framework, which privileges de facto and constitutionalises de jure a private-law society which calls what a system of undistorted completion delivers “just”, is an obstacle to social justice, and not its realisation. Such an observation concerns, of course, the relationship between democracy and justice. Democratic rule is legitimated, and even expected to reach out into the economy, to correct what markets deliver, to respond to the concerns of social justice. Democratic will-formation is not a sufficient, but is nonetheless a necessary condition of justice. This is probably a fair re-statement of a view that the contributors to our volume share and thereby, albeit sometimes only implicitly, indicate their allegiance to the welfare state, which Tony Judt called a common legacy of post-war Europe. And it is precisely this assumption, however, which provokes a discomforting query. Does the institutional design of the EU and the doctrinal backbone of the integration through law agenda block – rather that foster – justice? The first to articulate this critique quite powerfully was Fritz Scharpf back in 2002 in his seminal essay on the “European Social Model” – a point which he has re-stated many times and has re-stated ever more insistently under the auspices of austerity Europe. Scharpf’s asymmetry thesis is approvingly invoked a couple of times approvingly invoked (Douglas Scott, Menéndez), but also encounters some reservations (Kukovec). Gareth Davies complements and radicalises it. It is the Europe’s commitment to specific goals which excludes an open contestation about its objectives, fosters technocratic governance and affects the law’s proprium (262 f.). Let me re-state his point with an alienating Habermasian twist. We owe to Germany’s maître penseur one of the rare efforts to reconcile private autonomy as it is exercised – in particular in the economy – and our public autonomy as political citizens. Co-originality of public and private autonomy is his formula, which he has again used in the construction of the duality and unity of national and European citizenship. However, it requires much fantasy and confidence to proceed from these categories to a proliferation of justice through European democracy. Michael Wilkinson deals with the framing of the tensions between social justice and market rationality by a former student of Habermas who has become his most obstinate opponent, namely, the political sociologist Wolfgang Streeck. And the tensions are enormous: Social justice is based upon status, rather than contract law. It emanates and requires social norms with standards of fairness and reciprocity, social entitlements, social security, safety at work, participation in trade unions. Such accomplishments may well be not only socially desireable, but also economically productive. Both the social market economy of post-war Germany and the German variety of capitalism rest upon their institutionalisation. These institutional configurations represent, Streeck has argued, a “social acquis”, which should be recognised as a democratic accomplishment. This is an account, which builds upon Polanyi’s conceptualisation of the economy as an “instituted process”, one that pre-supposes an institutionalised social order both by and into which the economic is formed and organised. This is a challenge to Europeanisation as a form of or attempt at homogenisation, to the one-size-fits-all philosophy of integration and, even more so, the oddities of the new modes of European economic governance. And this point is of crucial importance for the argument I am going to submit. But before I can elaborate on this let me proceed to my second concern. The second concern is with justice between the Member States of the Union, or, to put it slightly differently: How can justice in the Union be fostered while its Member States retain autonomy and their economies do not converge socio-economically? Magister Aldricus of Bologna is the founding father of a discipline which seeks to answer precisely this question. Let’s move forward 700 years. In what has been praised as a Copernican turn, Germany’s juridical mastermind Friedrich Carl von Savigny developed the vision of a truly transnational legal order of private law relations that depended not on uniformity of substantive rules but on the readiness of courts – in all spheres of jurisdiction – to apply the legal order in which these private legal relationships were situated. Private international law was not intended to strive for “substantive” justice, but for uniformity of decision-making, which would be generated by the acceptance of jurisdiction-selecting rules which identified the “seat” of a legal relationship. This is the distinctive character of the “justice” that the discipline of private international law sought to promote. Savigny’s concepts were premised upon an understanding of private law as a non-political order. Respect of foreign law was no interference with sovereignty, public interests or policies. Law of such character was public law. In this – EU – domain, the opposite is true. Each state sticks to its own law. Foreign law will not be applied (“Kein Staat macht sich zum Büttel eines anderen Staates”, Gerhard Kegel). There is no such thing as justice between states. Their relationship remains in an unruly state of nature. How strange and outdated is all that really? John Rawls and Thomas Nagel are referred to in a number of contributions. I cite from Oliver Gerstenberg: “Nagel’s conception of socioeconomic justice is a political one: Socioeconomic justice, he argues, ‘depends on positive rights that we do not have against all other persons or groups, rights that arise only because we are joined together with certain others in a political society under strong centralised control’.” (Douglas-Scott; Walker; Kochenov all refer to the same sources). The merit of the discussion of these references is that they synthesise realism and normative concerns: What do Europeans owe to each other? On what normative grounds are transnational redistributive policies conceivable, normatively sound, and not merely an abstract utopia? To put it more straightforwardly: What are the Greeks entitled to expect from the Germans? The European Economic Community was not only a peace project. It was also meant to tame what we experience so drastically today, namely, the dark legacy of economic nationalism, a rigorous pursuit of economic interests by the sovereign nation states. Both economic constitutionalism and the constitutionalisation of the EEC Treaty can be understood as a response. But this response is insufficient. It does not bring about justice. This point is the common core of the book. It is a negative critique, not a positively elaborated alternative. What could such an alternative look like, given that we are not living in a European democracy and are not even sure about its proper design? The book offers a range of pertinent efforts. Oliver Gerstenberg’s democratic experimentalism is one, Kalypso Nicolaïdis’ demoi-cracy a second, human rights promotion a third. I cannot comment on all of them but I will focus on Jürgen Neyer and his “right to justification”. This choice is difficult to avoid. Both of us – back in 1997 – defended the concept of “deliberative supranationalism”. This notion was presented as an alternative to the orthodox supremacy doctrine. We suggested a reconceptualisation of the vocation of European law. European law should revoke the one-size-fits-all philosophy of integration through law and cease to strive for an ever more comprehensive body of law. European law should, instead, content itself with defining the duty of the Member States to take the concerns of their neighbours seriously, to search for what Fritz Scharpf has called a fair balancing of national autonomy and European commitments (“autonomieschonend und gemeinschaftsverträglich). David Innerarity talks about “inter-democracy”. Jürgen Neyer has pursued our intuitions further and re-designed them. Europe is not meant to and not able to transform itself into a democratic body politic, he submits. But it empowers European citizens to insist on justifications for the interference with their freedom and commits itself to supporting these claims. Neither Jürgen Neyer nor anybody else in the book mentions the legendary Cassis de Dijon judgment which indeed introduced a right to justification and defined its contents. I have often referred to this judgment as an exemplary illustration of how European law can be reconceptualised as a new, post-Aldricus and post-Savigny type of conflicts law. I continue to believe that the ECJ has delivered a just holding in Cassis, which mitigated fairly between German and French concerns while upholding the European commitment to free trade. But, by now, I also agree with the objections raised by Agustín Menéndez and Gareth Davies. These objections concern the conceptual framing of Cassis. The judgment replicates and renews the kind of economic constitutionalism which the infamous Lochner case of the American Supreme Court, decided back in 1905, proclaimed. Yes, the New York legislator is legitimated to restrain the freedom of contract, but restraints are constitutional only within the police powers of the state, i.e., when they “relate to the safety, health, morals, and general welfare of the public”. Yes, the Member States are legitimated to restrain free trade, but this is compatible with European law only where they protect health and safety, consumers and the environment. The Cassis framework as such forecloses, to cite Davies again, “the open contestation about the things that matter to society” (262). The book is much richer in its account of Europe’s deficits and potentials than my brief sketch. But it is high time for us to turn to Europe’s move from deficit to default, from justice deficit to injustice. The financial crisis has imposed itself on this project. The book deals with it intensively, be it directly or more indirectly. I summarise in the language and conceptualisations from the beginning. Integration was launched as an economic project which, thanks to the powerful alliance of the integration through law agenda and ordo-liberal economic constitutionalism, developed a neo-liberal tilt. Were the Treaty of Maastricht and Monetary Union a consummation of this project which should or could be rescued through the new modes of economic governance? Neither is the case in my account. The establishment of the EMU was, at best, a pyrrhic victory of economic constitutionalism, an ill-designed and fragile edifice. Its functioning was not ensured through law, let alone democracy, but instead depended on good economic luck and continuous political bargaining. What we are witnessing in Europe’s crisis management is not the correction of institutional deficits by a strengthening of legal rules, let alone an Endsieg of Germany’s ordo-liberalism as so many commentators, including such prestigious periodicals as The Economist, insinuate. Please recall that the strong state which ordo-liberalism advocated was operating with general rules and the subjection of economic policy to justiciable criteria. A system of undistorted competition was to govern the economy and its market citizens. Regulatory competition was to govern inter-state relations. Europe’s crisis management is nothing of this sort. Neither its core concepts – budgetary discipline, the fight against excessive macro-economic imbalances, the dedication to financial stability of the Eurozone as a whole, nor the quest or drive for competitiveness through so-called structural reforms and all sorts of austerity measures and the conditionality of assistance for states in difficulties can be operationalised by justiciable legal rules. The new regime cannot respect any system of divided competences, it requires discretionary powers which allow it to respond to situational specifics. All this is anathema to the creed of ordo-liberals. What Hermann Heller famously characterised as authoritarian liberalism was Carl Schmitt’s plea for a healthy economy in a strong state. I would like to conclude with a somewhat comforting message. And the message is this: Europe’s crisis management will not be able to deliver what it continues to promise. At the end of the first section, I mentioned the findings of the varieties of capitalism studies. There is a bright side: the social norms of the institutional underworld of instituted economies have, to date, proved to be surprisingly resistant. The dark side is that such infrastructures cannot be imposed from above. What Europe’s crisis management may achieve is a destruction of the southern economic cultures, but it will fail dismally to replace them with some other variety, including the Anglo-Saxon model. This article is based on a talk by Christian Joerges given at the book launch event at the London School of Economics on June 4, 2015. This is a sociological argument, albeit one with normative implications, at least for those with a commitment tot he legacy of the Frankfurt School. It is then simply insufficient to identify and defend “reasons for European integration as imperatives – as normative musts” (but see E.O. Eriksen, The Normativity of the European Union, London/New York: Palgrave Macmillan, 2013. For a lucid elaboration, see S. Rummens, “Democratic Deliberation as the Open-Ended Construction of Justice”, Ratio Juris, 20(3) 2007, 335–54. Apologies for a note which will look somewhat smart aleck in a book which covers that topic to intensively and in which Rainer Forst has contributed a chapter on “Justice, Democracy and the Right to Justification” (227 ff.). But the reconciliation of private and public autonomy and hence the defence of the idea of an intrinsic relationship between (deliberative) democracy and justice is of systematic importance in a context in which “the economy is our destiny”. That context is not addressed by Forst, neither in his chapter nor in the more extensive discussion of “Transnational Justice and Democracy”, Normative Orders Working Paper 04/2011, Frankfurt/M. 2011. But see his Das Recht auf Rechtfertigung. Elemente einer konstruktivistischen Theorie der Gerechtigkeit, Frankfufurt/M. : Suhrkamp 2007, 279 ff. Fritz W. Scharpf, „Autonomieschonend und gemeinschaftsverträglich. Zur Logik der europäischen Mehrebenenpolitik“, in id., Optionen des Föderalismus in Deutschland und Europa, Frankfurt a.M. [etc. ]: Campus 1994, 131 ff. Christian Joerges, “Rethinking European Law’s Supremacy” (with Comments by Damian Chalmers, Rainer Nickel, Florian Rödl, Robert Wai), EUI Working Paper Law 2005/12. SUGGESTED CITATION Joerges, Christian: Justice within and between Polities, VerfBlog, 2015/6/10, https://verfassungsblog.de/justice-within-and-between-polities-2/.